Anyone who ever seen a patch or emblem on a uniform knows there’s more than one way to decorate that emblem. Embroidery is one popular method, and it works great for a lot of applications, but not for everything. Sublimation is another good method for adding graphics and text to a patch and it allows you to do some things that embroidery may not allow. If you’re looking for the best method of adding decoration to your blank patches, here are some things to consider as you decide between embroidery and sublimation. How intricate is the design? – Embroidery is great for certain kinds of designs, but it doesn’t do well with gradients, fades, or designs with lots of small lettering and intricate features. Because sublimation is printing, sublimated patches can have designs that are very intricate and full of color, and can also handle gradients and fades. Does you design need a particular color behind it? – Color in the background of an embroidered patch is achieved by the color of the fabric used to make the patch. EnMart, for instance, has 25 different colors of fabric available, which may be enough for most situations, but not all. Sublimated patches, by contrast, create a color background using reverse print, which means they print the background color and then sublimate it on to the emblem. 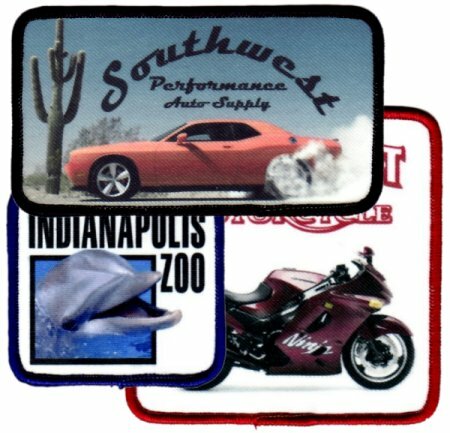 If you need a very specific color background, sublimated patches may be a better choice. What sort of artwork do you have? – While it’s true that the artwork for either an embroidered or a sublimated patch can be created from a drawing on a paper napkin, that’s generally the long way to go about it. Embroidered emblems usually require vector artwork and the designs also need to be digitized. Given the constraints of embroidery, the original design may have to be altered to eliminate details that are too intricate to be embroidered. Sublimated patches, by contrast, are photo-realistic, and can be printed with as much detail as necessary. Will your patch have to be weatherproof ?– While we’ll back our Iris UltraBrite Polyester thread against any other thread in the business when it comes to colorfastness and washfastness, thread can fade over time. Sublimation ink is not completely oblivious to sun and repeated washing either, but if the emblem will see a lot of outdoor exposure, it may be a better choice than embroidery in some situations. Whether you choose an embroidered patch or a sublimated one, you’re making a good choice, both for the identification of your business and in terms of a product that is cost effective and an effective method of advertising.